Previously we shared how to do your own manicure and nail care. This time we will talk about making French Polish. Before we start, you are recommended to do some simple manicure, for example files away hard skin at the sides and shapes your nails. 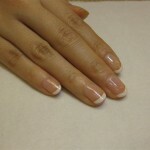 Remember, shape of your nail is one of the major factors in making good French Polish. Procedure: Polish your dominant hand. A thin layer of base coat is good enough. Tips: Keep your nail dust-free before start. Procedure：: Start with your little finger. Acquire small amount of polish and paint on the center of nail tip. Then go to the sides and connect the center mark. Depth of the white edge is by personal preference. Both straight line or smiley line are the most common. After five minutes, paint on light pink polish, but don’t cover up the white edge. TipsWhen painting the white edge, there are some points you should remember as the white paint is relatively easier to dry: 1) Acquire brushful of polish, 2) Avoid painting on the same position repetitively, 3) keep painting speedily. Smoothness connection of the white edge and balance of the curly smile should also be watched. Step 3: Top coat and Drip dry. Procedure：Allow ten minutes to dry off before painting top coat. Finally, give every nail a drop of drip dry. It is recommended to do both hands separately by 15 minutes. 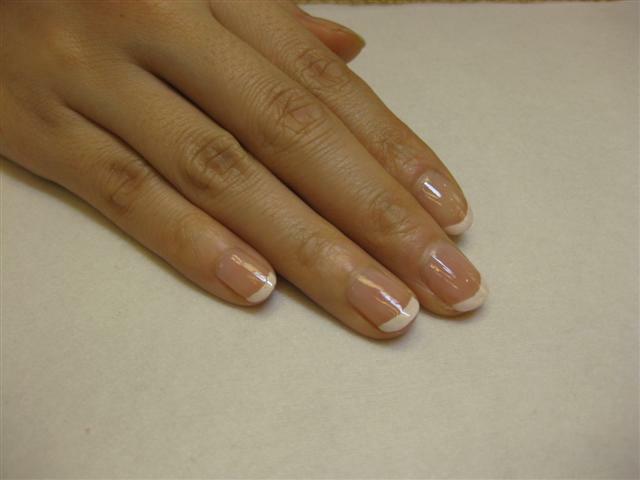 Tips：Top coat should not be too thin or thick. It is useless if too thin, and chance of bubbles if too thick. If you cannot make smooth white edge or balanced curvy smile, you may dip an oval-shaped pen with remover to perfect the edge. Remember to do it slowly and softly.